Aside from Mike and Sulley and the few nameless monsters we caught in the Monsters University teaser trailer last year, we were unsure of who else the film’s cast would include. Surely, with the film taking place on a college campus, the students would play an essential role. At Toy Fair a few weeks back, Disney/Pixar detailed several of the new characters that we would see in the prequel film. Today, a new poster has been unveiled and it is packed to the brim with characters. Take a look at the poster after the break! The poster, which was premiered by Nerdist, almost looks to be a part of some Monsters University school-pride campaign, similar to the college recruitment ad that was released in January. Hanging around the top of the image with the MU banner is Art, who director Dan Scanlon described as “that weird college guy.” I love Art’s character design, and I have heard that he has the potential to be quite the scene stealer. 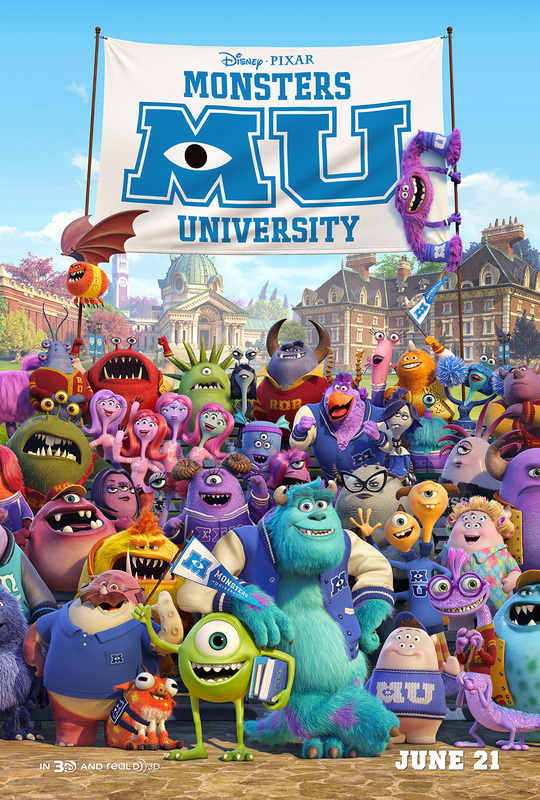 Monsters University hits theaters on June 21, which is now less than four months away.